Choose from KryoFacial™, KryoShaping, KryoSmooth, or a KryoSpot Treatment. The KryoFacial™ is truly one of a kind. 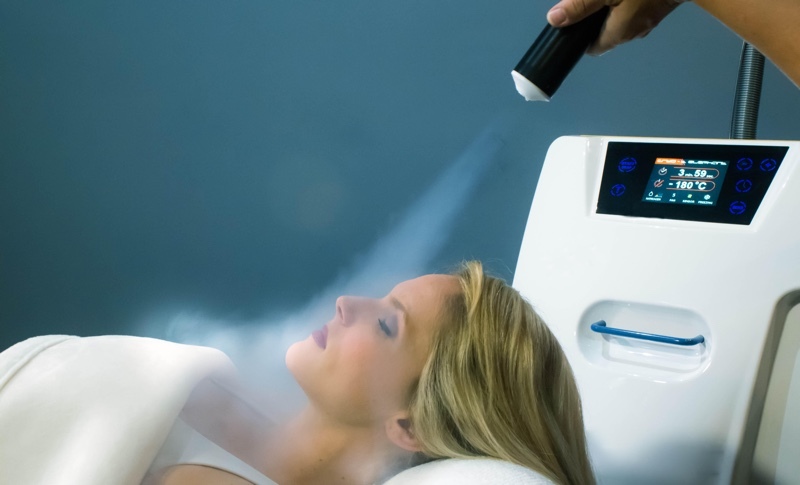 It constitutes a Cryogenic treatment, in which a controlled beam of nitrogen vapour is used to ‘freeze’ the skin of the face, scalp, and neck area. Applying this cold nitrogen creates an instant skin tightening effect that fills in fine lines and wrinkles and stimulates collagen to produce more cells which, over a course of treatments allows the skin to become tighter, more even toned, and refined. KryoFacial results in fast contracting and expanding of the skin’s blood vessels which in turn causes a surge of nutrient rich, oxygenated blood to flow through your blood vessels and feed your skin. The KryoFacial™ will flush away built up toxins in your skin, dramatically reduce pore size and soothe any skin inflammation. And as for that dreaded puffiness we all experience…Gone! KryoShaping is a 50 minute, safe, effective, and non-invasive way to reduce trouble fat areas. Cryolipolysis is treatment used to destroy fat cells. Its principle relies on controlled cooling to near 4° Celsius (approx. 39° Fahrenheit) for the non-invasive localized reduction of fat deposits in order to reshape body contours. The exposure to cooling is set so that it causes cell death of subcutaneous fat tissue without damage to the overlying skin. KryoSmooth is a 30 minute session to help get rid of those trouble areasof cellulite (3 sessions recommended). This beauty treatment focuses on the amazing skin benefits Cryotherapy has to offer. Cryotherapy stimulates collagen production in the targeted area by super-cooling the outer layers of the skin. As a result, the skin regains elasticity appearing both younger and smoother. Repeated treatments will reduce the appearance of cellulite leaving the skin more firm and even-toned. KryoSmoothing treatments are non-invasive and most commonly applied to the hips, abs, glutes, and legs.